When you leave home there are a lot of financial unknowns you’ll face as a student. How much are utility bills going to cost? Do I really need a TV license? Wait, isn’t water free? Amongst all of these uncertainties, then, it’s easy to think of food as a familiar face in this confusing circus. We’ve all eaten food. We know where it lives. Surely it can’t be that hard to factor food into your budget…can it? Obviously we all have differing financial situations, so I’ll just offer mine as an example to illustrate the kind of savings that can be made. At first, I allowed myself £40 per week for food, which I would usually spend by walking, once a day, into my local Sainsbury’s and attempt to buy no more than £5.70 worth of items. I later realised that this is a ludicrous way to spend my time. Not only is £40 far too generous a budget, but the whims of my appetite would, each day, lure me into overspending. The answer is simple: create and save a weekly online shopping basket, it’ll help you avoid temptation and if you give it the capacity to account for every meal of the week, you can simply rinse and repeat until the end of the year! In doing this, I have reduced my weekly food budget from £40 down to £25, with the £15 I save going directly into a savings account, week by week, so I’m constantly reminded how much I’m saving, and how easily a KFC could ruin it. Assuming a 33-week term, this adds up to nearly five hundred pounds; a figure not to be scoffed at. For just £1.20, my breakfasts are sorted for all seven days with an eight-pack of chocolate chip brioche rolls. They’re perfect to wolf down on the way to a morning lecture, and they’re nice and tasty to boot. Of course, if you prefer, many of Tesco’s own brand cereals are around the same price and, if you buy a longer-lasting milk such as almond, can work out just as cheap in the long run. Compare this to the tempting, daily £3 bacon roll from Greggs, and the savings quickly become apparent! £1 is enough to purchase two loaves of bread—plenty to supply sandwiches, especially when combined with an 80p butter. My standard basket includes four or five tins of baked beans for that student staple of beans on toast (which conveniently doubles as one of your five-a-day) while spreads such as jam and peanut butter can be attained for as little as 29p. Couple this with a multipack of Tesco’s own brand crisps, and you’re laughing your way through seven lunches a week. The evening meal is, of course, where the most variety comes through but, again, this needn’t incur massive expense. A couple of pizzas at a pound each is simplicity itself, and a pack of pasta with some accompanying tomato sauce can go a long way! Carrots and parsnips can be bought for just a pound between them and, combined with a bit of gravy and some £1 frozen potatoes, you’ve got the makings of a cheap and cheerful Sunday roast. As I’ll discuss below, meat doesn’t factor much in this example of mine, but if it’s an essential component of your roast, consider improvising with cheaper, sliced meats. Alternatively, precooked chickens can be acquired from many supermarkets for no more than a fiver; if you split the costs with your fellow roasters, this quickly becomes a good deal. Add to that some cheap soups and whatever else tickles your fancy, and you’ll quickly find that seven dinners emerge in your basket with very little strain on your wallet. So why is my menu so devoid of meat? This isn’t due to any hugely strong vegetarian ideals, but financial motives: meat tends to be the most expensive element of any meal, and is easy to avoid. Not to mention the health benefits! For example, in my roast dinner, I’ve prepared carrots, parsnips, potatoes, Yorkshire puddings and stuffing. All topped off with some gravy, and with the stuffing providing a dash of exciting flavour, I see no need to throw an entire chicken into the mix if I’m cooking just for myself! If you are, however, especially keen on bacon for those hangover breakfasts, be sure to scout out 2 for 1, BOGOF, or reduced price offers by comparing various supermarket sites. Meat can be frozen and it’s often best to buy more if it’s cheaper per unit and freeze the excess than pay over the odds for a single packet of bacon. When buying in bulk, you may wish to delete this option from your basket the following week, since the aim is to have plenty left over for multiple weeks. It hardly screams rebellious student, but when it’s so easy to factor your 5-a-day into your menu, why wouldn’t you? Multipacks of apples and bananas are an easy start, and can be used as snacks or eaten alongside lunch—they’ll only set you back by around £2.30. Add to that a 65p litre of apple juice, the aforementioned vegetables, beans and soups, and you’ll find yourself stumbling into eating your 5-a-day almost by accident. Always check labels to see what counts—I only recently learned that tomato pasta sauce contributes towards one, for example. Want more hacks to keep your fruit and veg around longer? Read our moneysaving kitchen guide. This is a deceptively important bit. It’s all very well to design a menu and promise yourself to stick to it, but the temptation to nip down the shop for a bit of chocolate is all too easy, so I find it’s best to account for it within your basket. In my case, I buy three packs of Tesco Value chocolate digestives for just £1.30—between those and the ample amounts of bread left over for toast-making, defeating the demons of the belly becomes much, much easier. Of course, all these examples are centred around my personal preference, but that’s the point—you can find yourself surrounded by food that you’re quite happy with, controlling your budget and your appetite, with the most minimal amount of effort and thought. You may wish to choose another supermarket; each comes with its own pitfalls—the minimum spend tends to be quite high, so you will find yourself paying an extra charge (£4 in Tesco’s case) for delivery, but workarounds such as ordering fortnightly rather than weekly, or else simply comparing different charges, are quite simple to mull over. 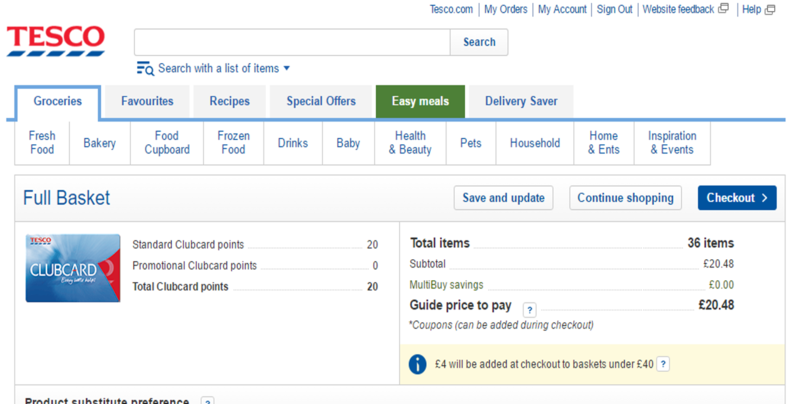 Sites such as MySupermarket can be a good starting point for comparing prices, and always sign up for a loyalty card with whichever supermarket you choose if they offer one, as those points add up fast and can be used to subsidise your next food shop, or, alternatively, meals out at restaurants such as Prezzo. So, there you have it. Set up and save your online shopping basket, and you’ll find food can be cheerfully budgeted for, alongside all the savings that entails. Liked this? Read about the tricks supermarkets play on you.